Roughly translating as clifftop, Uluwatu is renound for its striking clifftop temple, stunning coastline and crystal clear surf. The perfect location for romance and adventure, this experience allows you to see the best Uluwatu offers. Sumptuous seafood BBQ on Jimbaran Bay, famous for its giant prawns and tiger fish, dining under the glistening stars as waves gently crash into the rocks, majestically striking Kecak (Balinese) dancers, in dazzling traditional costumes, await in this experience. Following a visit to one of Balis most spiritual temples 'Uluwatu Pura', you will experience the traditional striking Kecak Balinese dance performance, before feasting on a sumptuous seafood BBQ at Jimbaran Bay. Not to be missed this combines the ultimate must do's whilst in Bali. 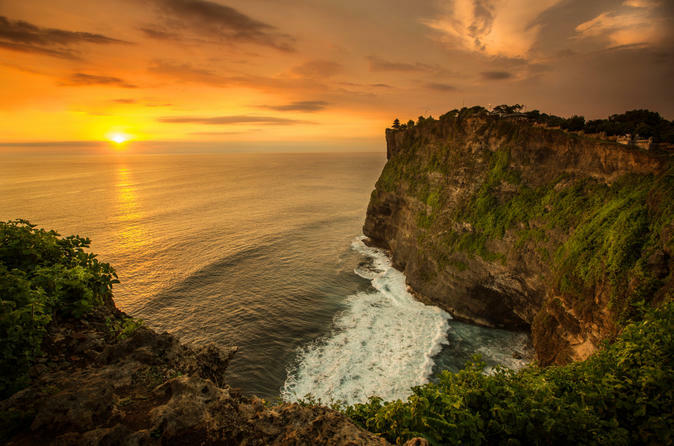 After hotel pickup by your guide, you’re driven along the winding shoreline to Uluwatu Temple, located among the southern cliffs of the Bukit Peninsula, whose dramatic precipices rise almost 330 feet (100 meters) from the Indian Ocean. Majestically perched on the edge of a steep promontory, the small temple dates back to the 10th century and is counted among six temples most revered by the Balinese people. With a beautiful ocean sunset as your backdrop, enjoy a kecak dance with traditional Balinese movements and chants performed in a circle around a blazing torch. Afterward, continue on to an expansive beach in Jimbaran Bay for a delicious barbecue dinner. Dine under the stars as you’re served a seafood platter including prawns, grilled fish, squid and clams, accompanied by rice, spinach and sambal (spicy Indonesian sauce). Your 4-hour experience ends with drop-off at your hotel.